When I saw Helen's dish of New Potatoes, Crispy Salami and Watercress Salsa Verde, I was positively giddy with excitement. I thought to recreate it in some manner. Of course, we didn't have potatoes. We have a source for salami and we dropped by there earlier in the day. But, of course, getting home, I realized that I forgot to get salami! Hmph. Well then, I guess it's just the salsa verde for us! I really, really, really wanted to put anchovies in, but JS vetoed that. I still don't know why. I was afraid that it was going to taste too anchovy-ish, given that the anchovies were not going to be "melted" into the sauce with heat. Maybe I was wrong: there's a marinade with anchovies that we'd like to try soon. Now to find a way to use our very verde salsa. 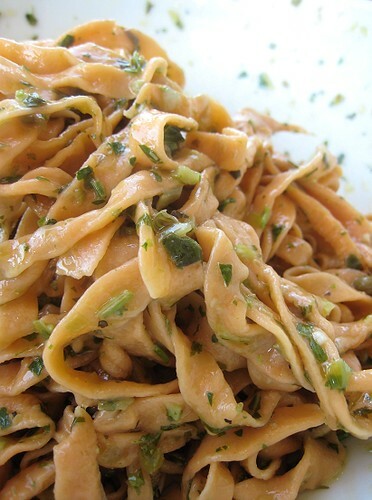 We rolled out some leftover tomato pasta (from our Ravioli "Caprese") and made fettuccine. We tossed the pasta with our salsa verde. Simple. In the same meal, our mother made one of her soy-braised dishes. In this case, it was soy-braised pork spareribs, with the ribs cut into 1" pieces. I imagine it was made the same way as her Cilantro Beef Shin, except without the cilantro. Oh, and of course, without the ginger as well, since, as mentioned, pork and ginger are not to grace the same dish together. I used a small bowl to eat the pasta. Afterwards, I decided to eat the pork, adding it to the empty-but-with-residual-salsa-verde bowl. The salsa verde and the soy-braised dish went so well together! 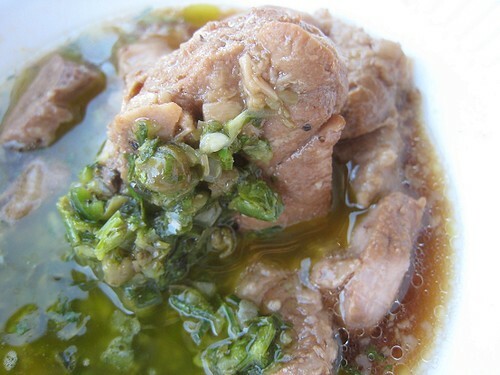 I rarely eat soy-braised pork spareribs (don't like the pork bones much), but I kept eating this, eventually getting some white rice to go with it and the salsa verde. 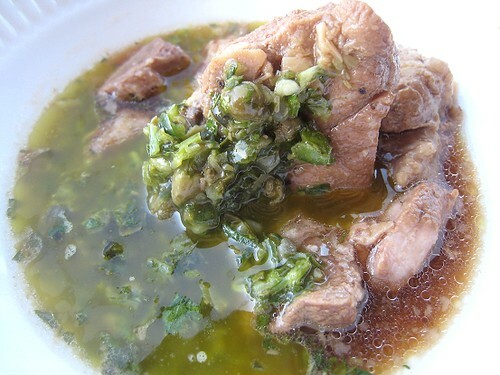 There was a salty-sourish punch to the salsa verde that really highlighted the flavor of the meat. I believe I added a tad "too much" cornichons than necessary, making this salsa verde function the same way as the salty-sourish pickled greens that are served on top of Taiwanese beef noodle soup. A post of Taiwanese beef noodle soup is something that we have been working on for a long time now. We have not been able to settle on a Taiwanese beef noodle recipe that we like, because we have not been able to figure out what exactly those pickled greens are. Asking around, some say they're "tong chai," others say "suan chai." I don't know if they're cabbage or mustard greens or maybe some other greens. Whatever pickled vegetable they are, they go well with rich meats like soy-braised beef (in beef noodle soup) or a fatty pork belly sandwich (gua bao) with cilantro and peanut-sugar. Maybe we have found a "cheater's" way now -- we can use this salsa verde to sub in for the Taiwanese pickled vegetables! Teehee. Gua Bao is soooo good! That soft white bun, the pork, the pickled vegetables(!!! ), the cilantro and especially the peanut-sugar mixture. I did a little search right now and found that people are calling it "Taiwanese hamburger". That is just wrong in so many ways. Why even bring up the hamburger?!!?!?! Wrong, wrong, wrong. update: We made our own! Here's our Gua Bao. If you'd like to participate, see who's hosting next week. WHB is hosted this week by Srivalli of Cooking 4 All Seasons. oh my goodness my goodness...that beef...mm mmm mmmm! The beef dish looks like a comfort food dish. I am so glad the anchovies were vetoed. Fabulous! :)) Must be the first one who only had eyes for the pasta dish. Yum! wow what a packed post. don't you love when you stumble on a new combination?! This looks wonderful. I love salsa verde, and this is an interesting new take on it. I love the idea of adding it to the tomato pasta, too. I love all the stuff in the salsa verde. Interesting salsa. 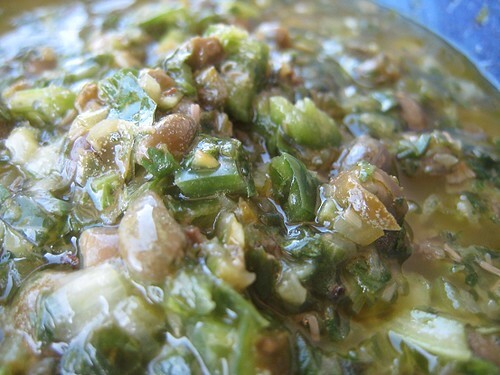 Have you ever tried salsa verde made with tomatillos? Oh, that is the best salsa ever! 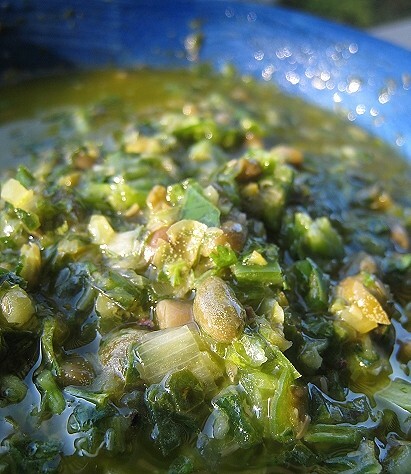 Salsa verde is one of my very favorite condiments. I could just sit and eat it with a spoon. Your post has inspired me to be more experimental and try it on lots of things! Whoa, I bet the salsa verda makes good Taiwan beef noodles! Yes, they use "suan cai" a lot in TWnese beef noodles. The pasta got overshadowed, hehe. That gua pao really is so good. The salsa verde looks amazing! yum! 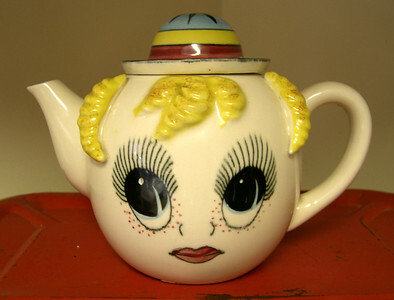 I can think of a whole bunch of things I'd like to smother it on! 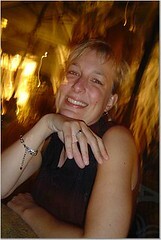 Glad I found you on tastespotting. It's nice to see fellow Vancouverites in the food blog world. You have a very nice blog! Interesting salsa verde! Love the idea of throwing in a bunch of stuff with the same color and blending it together. The anchoives sound good in it. Maybe a splash of nam pla would have been more agreeable? The salsa on the pork looks really awesome. Thanks for the lovely entry..I sure learnt a lot today! Your salsa verde looks and sounds sooo good. I'd like the anchovies too. They would give the salsa an extra punch. Sorry I am so slow at catching up on the WHB entries. I had a very rough week going back to school! The salsa verde sounds good, but I think you made the right decision on the anchovies!